There are probably a few things that you can think of doing with shaving cream. It looks so much like whipped cream that you have probably been tempted to prank your friends by putting shaving cream on their ice cream sundaes instead of the whipped cream that they love more than life itself. Or just having crazy shaving cream fights and falling all over the mess of shaving cream on your floor while talking about Humpty Dumpty and how his fall was so much more harmful than yours. But that’s child’s play. There are much better things that you can do with shaving cream, the following being just a few of them. Outside of pretending to be old enough to watch R-rated movies and have a few drinks at your favorite bar, you’re probably wondering why on earth anyone would actually pretend to be older. Well, there are lots of reasons. You could really love that residential building that is located next to the peacock feather picture frame store and across the street from that store that sells those splendiferous hats made of paper clips. Your heart sank all the way to the core of the earth when you made a visit to that building and were told that it was only for senior citizens. But your heart has been set on that building for a long time. So you decided that you would pretend to be a senior citizen to get in. The only problem is that with your flawless skin and big childlike eyes, no one is going to believe that you’re a senior citizen. So what you have to do is show them a head full of white hair. Use shaving cream to sculpt any white hairstyle you want. A beehive, a mullet, a mohawk, whatever you want. Bonus points if you can do a beard too and convince them you’re Santa Claus! Get Rid of Cat Hair! 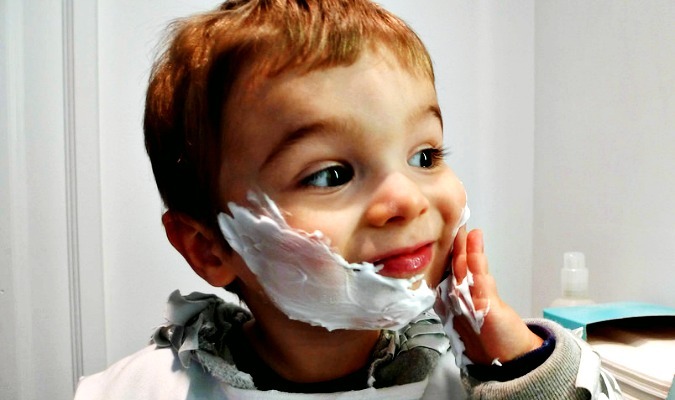 Pretty much everyone knows that the primary purpose of shaving cream is to get rid of unwanted hair. But who says that this hair needs to be growing out of your body at the time you get rid of it? Why not also use shaving cream to get rid of hair that just happens to be lying around? You just had to get that long-haired cat. The first time you looked into her eyes, you fell in love. But you failed to take into consideration all of the hair she would shed around your home for a good part of every year. And there is a ton of hair. You don’t even remember what color your carpet was before you got this cat, because all you can see on the floor is cat hair. It’s all over your couch too. So here’s what you do. Lather your carpet and couch with shaving cream, get some razors, and shave all of that cat hair out of there. Your home will look just like it did in the old days! When you were a kid, you had to do all of your work in pencil – so you were able to erase your mistakes. But now, you have to use a pen a lot of the time. And with most pens, you can’t really erase mistakes. You can use white-out, but then you have to keep remembering to buy it at the store, and you’re constantly running out of it. So if you don’t want your boss to know that you wrote about your undying love for rotten turkey gizzards on those expense reports that you need to turn in tomorrow, you should come up with another way to cover up that kind of stuff. Did it ever occur to you that shaving cream is just as white as white-out? It might be harder to use on a piece of paper just because it creates a foam rather than a thin layer of paint, But that doesn’t mean you can’t use it. You just need to put it on there and wait for it to dry. Once it flattens and dries, as long as you use enough of it, it’ll cover those mistakes up just as well as any white-out ever could. You’re embarrassed to tell people this, but you just love looking in the mirror. And why wouldn’t you? Ever since you started doing cartwheels down the stairs for an hour every day, you have never been in better shape and have never looked better. But you have always been a very cerebral person, and you are concerned that this change in your looks has made you a vapid, vain person. Considering that you have shaving cream in the bathroom right there where you spend 25 hours a day looking in the mirror, this will be very easy. All you need to do is to smear the mirror with shaving cream. That way, you won’t be able to see in the mirror anymore, and there will really be a no point in even looking at the mirror anymore. You will now be free to resume your life as it was before you turned into a superhuman beauty and be one of the normal human plebeians again.